Each week Kirby will dig into a word that will help in personal development, sales, and growth. The weekly word is designed to be short and sweet, and provide a quick lesson that will help you grow each week. 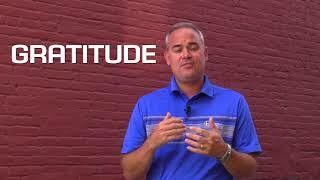 THE 30 DAY CHALLENGE The Hasseman Marketing weekly word this week is GRATITUDE. The fact is studies will tell you that if you are more happy then you are more likely to succeed. Kirby feels that we have that all backwards in life. He says that people say to him all of the time “how do I become more happy?” Kirby answers this question by telling us to become more grateful. If you want to become more grateful, Kirby gives us an exercise on how to do this. In this video, he teaches us to go around each day and to think of reasons to write someone a Thank You card. Kirby says the first week is going to be pretty easy. You will be able to think of customers, mentors, neigbors, friends, and people that have helped you along the way. Kirby preaches that as you continue to go through this process and look for things to be thankful for, guess what…..you are going to find it! You are going to be more happy! Kirby challenges us to go through a GRATITUDE exercise. In this challenge he suggests to spend thirty days and try to send a Thank You card to someone every single day. Don’t miss a day. Be diligent and stick to this exercise. By doing this exercise, Kirby feels this will reshape the way you look at your world. Want to keep up all the time? Make sure to join our VIP List! Our VIP’s get an email with the latest content…and other special offers as well. Join here.